Kimberly (Bragg) Koll became interested in residential real estate at a young age; While visiting her grandfather’s Los Angeles real estate brokerage, she studied the residential listings her grandpa and uncles had posted in the office window. Her grandfather, Ron Bragg and his brother opened a real estate office in Los Angeles in 1960 which grew over the next 25 years to a multi-office firm with nearly 125 agents and staff. Following in the family real estate business, Kimberly’s father, Mike Bragg was just 18 years old when he obtained his California real estate license in 1971. Working within the family real estate business, he earned distinction in 1973, becoming a member of the local multiple listing service’s Million Dollar Club at the age of 20. Growing up in a real estate family, Kimberly decided at a young age what she would do someday with her professional life and career. Upon graduating from University of San Diego with a B.A. 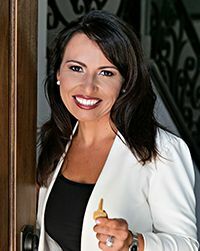 in Communication and Urban Studies (real estate emphasis), she began working in commercial leasing at CB Richard Ellis, thriving in the corporate commercial real estate world, but knowing her real career passion would be to serve home buyers and sellers in the residential real estate industry. Kimberly’s resume includes working with San Diego’s #1 real estate agent in the 92127 area, as well as one of Poway’s top producing agents. Working with top-selling agents sets Kimberly apart from other realtors because of her extensive first-hand knowledge of what works and what doesn’t work when it comes to selling homes and negotiating offers. Directly involved in hundreds of real estate transactions, she excels in all aspects of real estate, from conducting pre-marketing campaigns, to the listing process, reviewing of offers, conducting negotiations, and finally to the opening and final close of escrow. Her market niche areas include the communities within the Poway Unified School District & I-15 Corridor; her expertise is expansive as she was raised in San Diego County and she has lived in various neighborhoods: Clairemont/USD, Pacific Beach, & Downtown. Kimberly is married to a naval officer, and mother of two children ages 4 and 2. Several years ago, as a wife and young mother, Kimberly experienced the challenges associated with being a military wife and new mother with a husband on overseas deployment. From this life experience, she has developed a high level of compassion for military families dealing with the deployment of a spouse. Kimberly is a unique individual with the strong business ethics, academic knowledge, hands-on experience, and the people skills essential for securing excellence in today’s keenly competitive residential real estate business environment and culture. When selecting Kimberly (Bragg) Koll, rest assured that she will do everything to make your home purchase or sale an easy and enjoyable experience for you and your family.